IPI Executive Board Member George Brock (R, center) and SEEMO Secretary General Oliver Vujovic (R, near) discuss criminal defamation laws and other press freedom issues in Slovenia with Dragan Matić (L), chair of the Culture Committee of the Slovenian National Assembly, and Bojana Muršič (second from L), chair of the Justice Committee, during an IPI/SEEMO joint visit to Slovenia Nov. 20-21, 2014. Photo: IPI. VIENNA, Nov 24, 2014 – The International Press Institute (IPI) and the South East Europe Media Organisation (SEEMO) today expressed optimism about the possibility of defamation reform in Slovenia following statements of good will from key Slovenian officials. Justice Minister Goran Klemenčič, a former anti-corruption official, told a joint IPI/SEEMO delegation that he was “personally against” the application of criminal law in defamation cases and that “in the long run, we would like to see criminal sanctions [removed]”. IPI as well as a wide range of other international actors, including the U.N. Human Rights Committee, the Parliamentary Assembly of the Council of Europe and the Representative on Freedom of the Media of the Organization for Security and Co-operation in Europe, have called for states to decriminalise defamation, pointing to the potential for media self-censorship that may arise from the threat of criminal sanctions. In recent coverage on its website, IPI has highlighted examples of the abuse of defamation laws in Europe and its practical impact on journalists. Both IPI and SEEMO underscored to officials the fact that Slovenia had fallen behind its neighbours in terms of criminal defamation. While the Slovenian Criminal Code maintains five separate defamation-related offences all punishable with at least six months in prison, fellow former Yugoslav states Bosnia and Herzegovina, the Former Yugoslav Republic of Macedonia (FYROM)/Republic of Macedonia, Montenegro and Serbia have already repealed criminal defamation provisions and Croatia has abolished the possibility of imprisonment. Even Italy, the only EU state that continues to sentence journalists to prison for defamation, is currently debating a bill to remove its prison provisions. 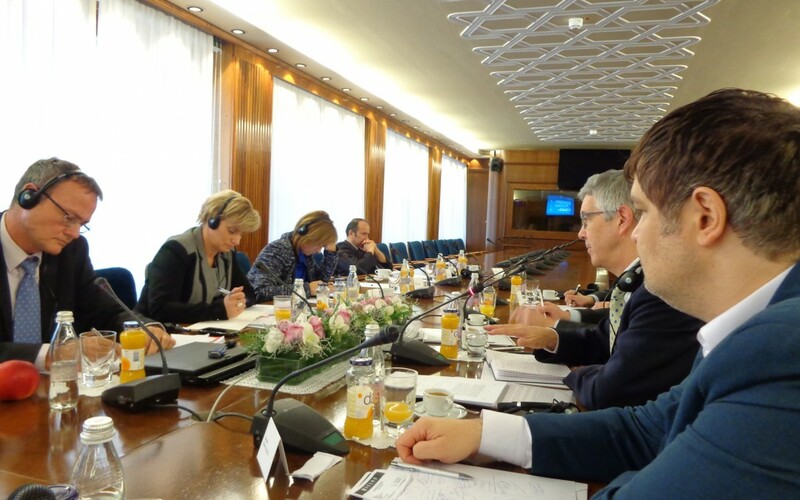 While the delegation’s two-day visit to Ljubljana was primarily focused on defamation, members communicated to the Slovenian government their deep concern regarding the prosecution of Delo investigative journalist Anuška Delić on charges of publishing classified intelligence. The case – which will enter its main trial phase in January – has spurred calls to restore a clause to the Criminal Code providing broad exemptions from liability for such disclosures, including disclosures made in the public interest. The clause was removed in 2008 under former Prime Minister Janez Janša, whose stance toward the media was frequently combative, according to media and civil-society observers. Most of the officials with whom IPI and SEEMO met declined to comment on the Delić case specifically, citing the ongoing judicial process. Minister Klemenčič did, however, indicate that the government was planning to table a bill that would protect the publication of classified material in the public interest, although the bill apparently would not protect the act of leaking information itself.